I am considering buying a gennakker for my Hanse 312. In the existing wardrope we have a selftacker jib (tri radial, laminated cloth with vertical battens), a 140% genoa (tri radial, laminated cloth) and a spinakker. As you all know the jib is not the best solution when running down wind and the genoa is big, heavy and requires some wind in order to perform. Last but not least we have the spinakker which is wunderful when going down wind at 120° to 180°, but requires a lot of lines, lots of hands and a heavy pole. At the end this means that during crusing with the family the spinakker is not used, but is only used when racing in club regattas. Solution: a genakker with a snuffer/blackbox/sail sock seams to be a good solution for both racing in the club regattas and crusing with the family!? I have been looking at a standard genakker from Ullman Sails. 64m² and optimized for wind angles from 80° to 155°. I used to own 312 earlier. I did initially buy gennaker and then genoa later to my boat. My experience is that performance gain when switching genoa to gennaker is not all that significant. In our case result was that gennaker was only used at really light winds and during longer passages. So if I would do it again I would not have gennaker at all for cruising. And for racing spinnaker would be more optimal without any doubts. With our hanse boats, I expect a lot of us is not sailing up/down regattas. Therefore a setup that fits singlehand sailing, will also fit most distance regattas. 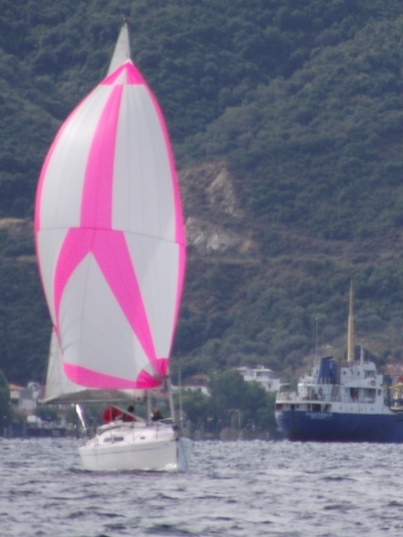 If you race a type/class-boat you offcause need a genua and a spinaker. Very large genakker with snuffer ( as wide angles as possible). With that setup, you will only have problems winning against other boats when the wind is right in the back. An interesting discussion and although I dont own a 311/312/315 and also dont race at all including distance racing, I do like to sail fast and optimally. I love the theory of flying a spinnaker with all the options it gives you but it seems to be to be high maintenance requiring lots of attention unless of course you are a Vendee Globe participant and do it all in unbelievable conditions!! I race my 315 for the last two years now in ORC Club. I had a 52m² asymmetric spinnaker for the first season that came from another boat and although it gave good speeds it was small for the boat. When I ordered one made for my boat all sailmakers said 65m² is what was right. Compared to a symmetric spinnaker it is much easier to use, and I can go up to 150° with the tack line eased to about 2 meters. When I cruise with family I never use it. I prefer to use my 130% dacron square genoa. I use this for racing as well, and it works fine with winds from 6kn up. I also have 110% heavy genoa, good for upwind and storm jib for 30kn up. The NS self tacking jib is useless in my opinion, unless single handed. So my advice is buy an all round gennaker if u want to improve racing and easy cruising in light winds. I use mine up to 25knts apparent. Code zeros are not that versatile. I am interested to understand why you say the code zero is not that versatile. I have no experience flying one but we are considering one for the future. We use an asymmetrical currently for downwind sailing in light winds and suffer when sailing to windward in light winds with the self tacker. The code zero is a spinnaker used at 60-40 degrees AWA in true wind speeds under 10 knots. And it does just that! In my opinion get a light 130% genoa and you can do everything, easier, less costly and you can go upwind 30 degrees AWA easily. I suppose the other advantage of a genoa is that it is more easily tacked. I would want to mount it on a separate furler though to avoid having to take the self tacker down. I have heard others say that having gone for a large genoa that they find it too heavy and would have preferred a code zero. I wonder if weight is the only issue here? A lot of the manufacturers that are offering non overlapping jibs these days - self tacking or not - are advising new buyers to go for code zeros. With the position of the shrouds, overlapping genoas are often no longer an option although on the H350 our shrouds are in board which I persoanlly find to be an advantage. Elvstrom sails have offers at the moment. Elvstrøm is probably the world leader in sailmaking with their EPEX series. I think, however, that their strength is upwind sails. In danish "yardstick" you are not set back using a Code 0. As long as you have a spiniaker. Mayby a Code 0 will not go as "high" as a genoa but you get the speed. Therefore a Code 0 wil be the best for a distance-sail vs. a Up/down regatta.